The Cliff Hart Agencies, a Michigan-based firm offering insurance and financial consultation services from offices located in South Lyon, Dewitt, Williamston, East Lansing, Ann Arbor, and Farmington Hills, is announcing a regional charity drive to benefit a basketball coach who needs treatment for a brain tumor. 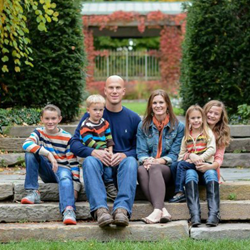 Jason Bauer and his family are longtime members of the Williamston basketball community. The night before the Williamston district opener last season, Bauer was experience severe headaches, and after a trip to the doctor he was diagnosed with Glioblastoma, a malignant brain tumor. This charity event intends to raise funds to help the Bauer family during this difficult time. “Jason Bauer is a family man and an important member of the Williamston community, and we’re proud to stand with him until he overcomes this challenge,” says Cliff Hart, owner and acting manager of Cliff Hart Agencies. Reaching out over social media platforms, and utilizing an email bulletin system, Hart and his team are gathering support for the Bauers from entrepreneurs and families throughout the state of Michigan. The Cliff Hart team will also be producing a full length article featuring Bauer and his family for publication in the firm’s online magazine “Our Hometown”: http://www.cliffhartagencies.com/Our-Hometown-Magazine_41. Over the last year, Cliff Hart Agencies has worked with half a dozen charitable causes and nonprofit foundations throughout Michigan. As active participants in the nationwide “Agents of Change” charity involvement initiative, the Hart team plans to continue working with regional charities on a bimonthly basis. Those who would like more details on the charity event to assist Jason Bauer, and those who wish to join the Cliff Hart team and help provide support to the Bauer family, are invited to visit this page: http://www.cliffhartagencies.com/Lets-Bring-Hope-and-Joy-to-Basketball-Coach-Jason-Bauer_21_community_cause. Future charitable events hosted by the Cliff Hart Agencies team will be detailed on the firm’s Community Causes page: http://www.cliffhartagencies.com/community-cause.